Fall is that time of year when chefs can't seem to help themselves. They tend to find more and more ways to use pumpkin flavor in food and beverages. There's pumpkin donuts, pumpkin ice cream, pumpkin spice cookies, pumpkin beer, pumpkin latte, and of course, pumpkin pie. “If you believe the sales pitch, the pumpkin is the happiest, healthiest food ever,” said Suzy Weems, registered dietitian and professor of nutrition sciences in Baylor University’s College of Health and Human Sciences. But not everything with pumpkin in it is good for you. And some things might be fine, if consumed in moderation. Fiber: it has plenty and that helps those watching their waistlines, since it promotes a feeling of being full. Zeaxanthin: This common carotenoid alcohol is a powerful weapon against age-related macular degeneration and impaired eyesight. Low in cholesterol and high in Vitamin A: this combination leads to healthy skin and eyes and also may help in fighting cancer. Heart-healthy phytosterols: You get this benefit if you eat the seeds. Magnesium, manganese, copper, phosphorus, protein, zinc, and iron: “On the USDA/FDA rating schedule, pumpkins are a good source of all those,” Weems said. The combination makes for a veritable "cocktail" for energy, growth, and a top-notch immune system. 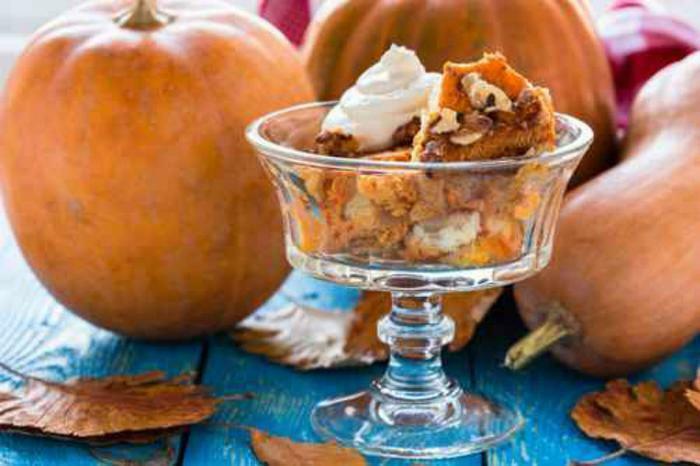 Pumpkin desserts: “Be sure to notice how much pumpkin is really in it, that it’s not just the flavoring,” Weems said. In short, Weems says pumpkin can make the season more flavorful, but it can also be a Trojan Horse of calories. If you suffer from diabetes, look closely at the sugar and total carbohydrates. “If you have cardiovascular disease, look at the fat,” she said. “Always be sure to read the container or the wrapper."